Holy crap, we used to listen to the hell out of this album. You allude to the fact that its not everyone's favorite, and if that's true then those people are straight up idiots. This record is near perfect and has to be my second (sometimes first) favorite of theirs. 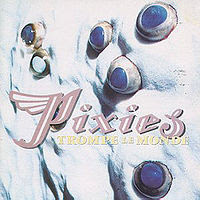 "Trompe Le Monde" the song is simply untouchable. "Alec Eiffel" is pop perfection and somehow pulls off being a sincere tribute to an architect. "The Sad Punk" seems to be a forgotten gem of theirs but has always been one of my favorites. The ending is gorgeous. Don't front. You use to LOVE "Head On." You even bought The Jesus and Mary Chain cassette because you loved that song so much. I still do. I'm not too cool. I have a distinct memory of catching the last half of this video at Grandma's house and being blown away at how awesome it was and having to wait like 5 years to see it again (these kids today with their Youtube). People have tried to ruin "U-Mass" for me but I have fought that off. I agree with you that "Palace Of The Brine" and "Letter To Memphis" should always be joined at the hip. Also, they are both astounding in their awesomeness. Speaking of awesome, "Bird Dreams of the Olympus Mons" has to be one of Frank's crowning achievements. Its one of those songs that I have heard a million times yet still manages to give me goosebumps every time. The melody and lyrics are simply unbeatable. I remember really loving that Denis Miller performance at the time. Also, how could anyone not love "Motorway To Roswell?" I have some weird memory of listening to this album for the first time in a while in my 20s and all of a sudden this song hit me. It was like I had never fully paid attention to it before. It was odd. Lord knows I share Frank's affinity for aliens and he somehow once again pulls off an earnest and heartfelt song about a topic that could be real lame if done the wrong way. Although this album will forever remind me of being 14 it has aged incredibly well. If I hear someone front on this I will punch them in the stomach. And that clip of them on Letterman is surreal. How did we not catch that at the time? What a bunch of rooks we were.